Like clockwork, purple spot has appeared in some asparagus plantings during mid- to late-April for the past 3 years. Purple spot, caused the soil-borne fungus, Stemphylium vesicarium, can cause problems during cool, wet spring weather (much like we have had over the past week or so). Symptoms, just like its name, include numerous, sunken oval-shaped spots on spears during the harvest season and more importantly on ferns and stalks during the summer months as long as conditions are ideal for its development. Often, purple spot will disappear as quickly as in appears on spears during the spring production season depending on the local weather conditions. As soon as the weather becomes dry and warm (as it appears for the weekend), expect purple spot to disappear. Unfortunately, heavy purple spot infection during the summer will lead to premature defoliation which will decrease carbohydrate reserves for the next production season. Control of purple spot can be difficult because of management issues (i.e., the need for fall mowing and/or removing, burying, or burning of old fern material in the field) and because fungicides can’t be applied during the harvest season. Growers who had pre-mature defoliation issues last year may expect problems this spring. Controlling purple spot begins with preventative fungicide applications during summer and fall by reducing infections to ferns and stalks. Weekly scouting and timely fungicide applications once fern stalks are full size should be done. Apply and rotate azoxystrobin at 6.2 to 15.5 fl oz 2.08F/A or chlorothalonil at 2.0 to 4.0 pt/A. 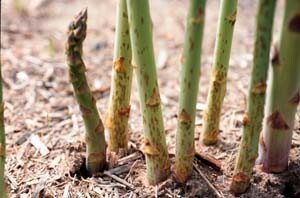 Organic asparagus growers, as well as conventional growers, need to take appropriate preventative measures to help reduce inoculum loads by completely removing, or by chopping and burying old fern material at the end of each growing season. Remember, any plant material that is infected and left to overwinter in the field may act as a source of inoculum the next growing season. For more information on organic asparagus production please see ATTRA’s Organic Asparagus Production.